Of all the salmon species that exist in New York’s waters today, including Chinook, Coho, Pink and Sockeye, only the Atlantic Salmon is native to the state. Lake Ontario once supported a population of wild Atlantic Salmon. This population may have originated from the anadromous form which is one that lives a large part of its life in the ocean and spawns in freshwater. The anadromous form may have migrated up the St. Lawrence River to Lake Ontario and into its tributaries and never returned to the Atlantic Ocean but used Lake Ontario or the Finger Lakes as a substitute for the ocean. This form of Atlantic Salmon is referred to as “Landlocked”, and this population of Landlocked Atlantic Salmon was once quite large and there were major spawning runs that existed in the Salmon River system, Oswego River system, and the Genesee River system as well as others. The loss of suitable spawning habitat caused the decline and subsequent extinction of New York’s Atlantic Salmon population. Some of the major contributors towards the loss of spawning habitat were, dams which blocked access to prime spawning areas, agricultural run off which covered spawning areas with silt, and the removal of stream-side trees which caused increased water temperatures, over harvesting, and water pollution. By the late 1800’s the native Lake Ontario salmon were gone. At present there are many lake and tributary systems across New York State that have populations of Landlocked Atlantic Salmon. Unfortunately these populations are maintained by annual stocking programs. There is very little if any natural reproduction due to the presence of a small fish commonly called an alewife, which is not native to Lake Ontario or the Finger Lakes. The Alewife invaded the Great Lakes and reached a peak in the 1950’s. Two examples are Lake Ontario and Cayuga Lake which both harbor populations of Alewives. The skin of the Alewife contains an enzyme (thiaminase) not found in the natural forage base of the Atlantic Salmon. This enzyme causes the breakdown vitamin B-1 (thiamine) which is essential to successful growth of the alevin stage of the atlantic salmon. With this vitamin deficiency the alevin usually die. Although natural reproduction does not occur, many stocked Atlantic Salmon return to the streams were they were stocked and can be viewed as they spawn from mid October to mid November during the peak of spawning activity. Unlike pacific salmon such as Chinook and Coho which have also been introduced into some New York’s waters, some Atlantic Salmon may return to their home lake after spawning and may return to spawn again. So they can sometimes become quite large, which is a good reason to practice catch and release. There is research being conducted in a combined effort between Universities, state and government agencies to determine the feasibility of Atlantic Salmon restoration to New York. At present through stocking programs Atlantic Salmon can be found in Lake Ontario, the Finger Lakes, some Adirondack lakes and Lake Champlain. Recently programs to re-introduce the native forage fish of Atlantic Salmon are being investigated. 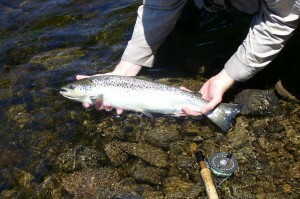 The Atlantic Salmon is still regarded as one of the top game fish in New York. They are known for their hard runs and incredible leaping ability which makes fishing for them an exciting experience. 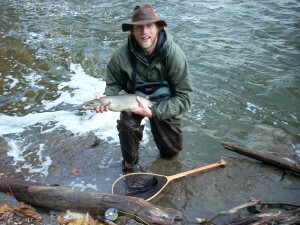 New York anglers can use a variety of fly-fishing techniques at various times of the year to fish for Atlantic Salmon. 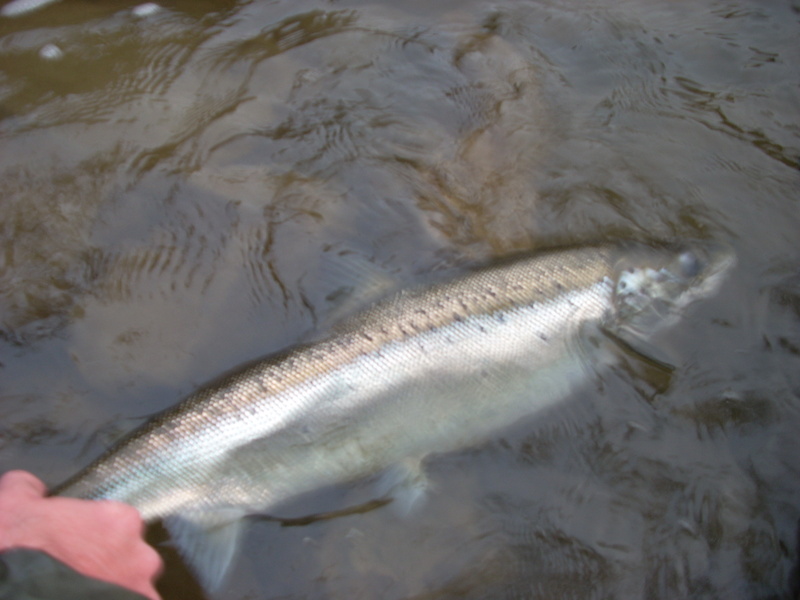 In the spring when off shore water temperatures are still cold salmon can be found along shorelines feeding on bait fish and they also may enter the lower stretches of tributaries to feed on schools of bait fish, such as the rainbow smelt or alewives. In the Lake Ontario tributary system they may enter a river in the spring and stay in the river until spawning in the fall. Streamer patterns that mimic small bait fish are effective at this time. A 9 to 11 foot 6 weight fly rod or even a longer 12 foot plus rod are good choices for battling the wind and casting streamers in the early spring conditions. Sink tip or sinking lines work well but at certain times a floating line can be used when salmon are in close to shore chasing bait fish near the surface. When salmon move into the lower stretches of tributaries following the smelt or other baitfish they will often feed furiously, but the action often does not last long as they move out as quickly as they entered the tributary, which will require being in the right place at the right time. Swinging the streamer as well as varying the retrieve with quick stripping motions will entice salmon to strike when they are chasing baitfish. During the spawning season when salmon move upstream in search of a mate, the fly-fishing strategies are somewhat different. The salmon are not moving into the stream in search of food as they are in the spring, but enter as a result of an instinct to spawn. Although it is commonly thought that they are not feeding, they will still strike a variety of flies possibly out of aggression and territoriality, including dry flies, as they protect their spawning areas or hold in a pool during their migration. Post spawn salmon may also resume feeding and can become veracious feeders. Salmon can be taken using a variety of techniques and patterns in the fall. Stripping and swinging streamers is one method as salmon can violently strike a streamer as it moves through the area in which the salmon has taken temporary residence or where the female has prepared a spawning bed. Swinging small wet flies and nymphs will also produce strikes. When the water temperatures start to drop in late fall and winter and the salmon in the tributaries become less active and the salmon will be less likely to move aggressively and will be more likely to strike a nymph on the dead drift, but will occasionally grab a well presented streamer pattern. Atlantic Salmon, the only native salmon to New York, is a prime example of how the pressure of modern human civilization can cause the decline of wildlife. Although the wild salmon are gone from New York, there is still opportunity to see salmon as they take part in their annual spawning migration. As they are truly one of the most exciting fish to pursue with a fly rod. The soft partridge hackle has lifelike action in the water, making the fly appear alive, like a swimming, struggling, or emerging nymph or small fish. This fly can be fished using various techniques including the dead drift, the wet-fly swing, and in slow water they can be retrieved using a very slow stripping action. All of these techniques I have found to be effective at various times and conditions while fishing for New York’s Atlantic Salmon.